Villages making the same dish the same way for decades show traditional Vietnamese food can stand the test of time. 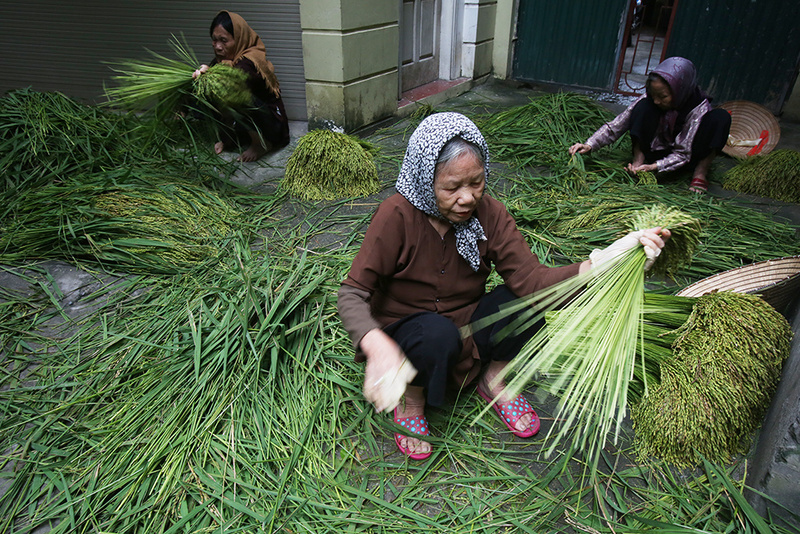 Me Tri Village in Hanoi is known as one of the two oldest places in the country where people make com, or beaten green rice, a seasonal dish made from immature rice kernels that is much sought after in the fall. Packed in lotus leaves, the soft and fragrant green rice can be enjoyed plain, with bananas, made into a cake with mung bean filling, as a sweet soup or even with ice cream. The dish is a trademark food of Vietnam’s capital city. When U.S President Barrack Obama visited Hanoi in 2016, he bought some for himself as he visited Me Tri Village, more than a hundred years old, where almost 50 families wake up as early as 3 a.m. to keep a culinary tradition alive. 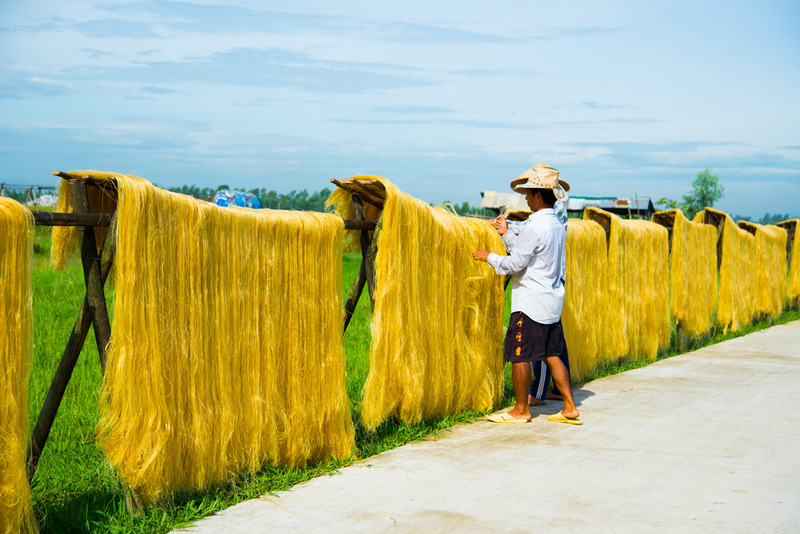 Vietnam’s love for noodles cannot be adequately described in words, but in the Cu Da Village, 13 kilometers to the south of Hanoi, there is no need to. 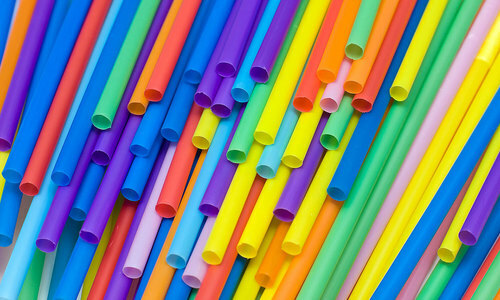 Here it can be seen, touched and tasted. Locals in the village has been making mien, or glass noodles, for about 70 years. Glass noodles are made with arrowroot, which is ground into flour, mixed with water, steamed, dried and split into thin, long strings. They are used as the base ingredient for many different soups cooked with chicken or pork. Cu Da residents started out making the vermicelli for their own consumption, but the thin and transparent noodle became so popular that it became the main business in the village, with hundreds of tons sold each year. 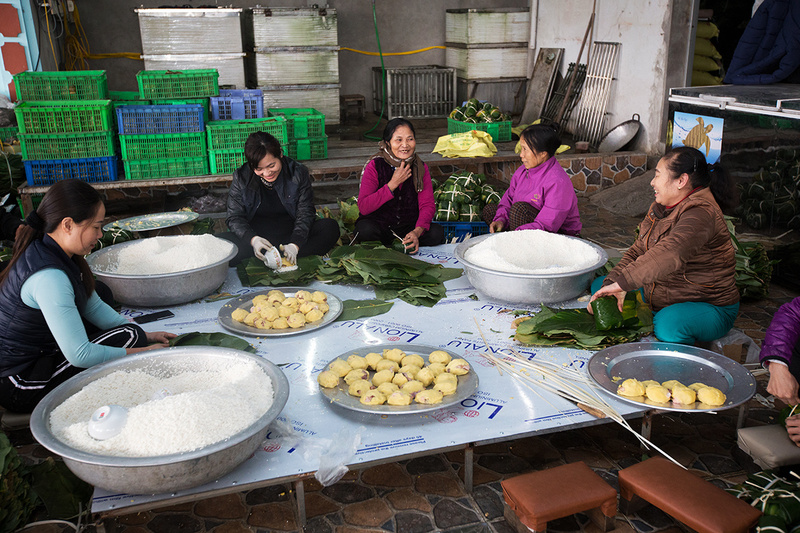 Tranh Khuc Village in southern Hanoi each day makes hundreds of banh chung, a square-shaped pack of sticky rice with meat and bean fillings wrapped in green leaves and cooked for hours on wooden fires. Almost one-third of 300 households in the village make the dish every year with such precision that they can pack a banh chung in 30 seconds. 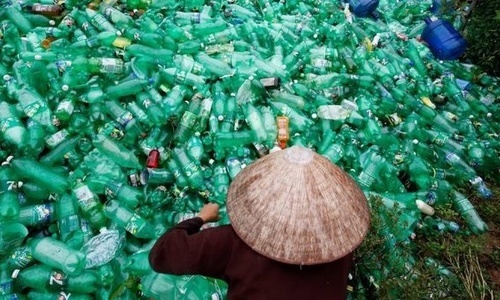 A family can make 500-1000 banh chung a day, and sell it for around VND50,000 each ($2.16). In the Vu Dai Village in the northern province of Ha Nam, local residents simmer thousands of fish pots a day to make ca kho, a braised and caramelized fish dish. Like other Vietnamese dishes, ca kho is made using a variety of spices including ginger, chilly, lime, galangal, caramel, and fish sauce. A family of six can handle the usual business, but on special occasions, they might have to employ up to 60 people in order to manage the flame for 600 fish clay pots that contain 1.8 tons of fish. 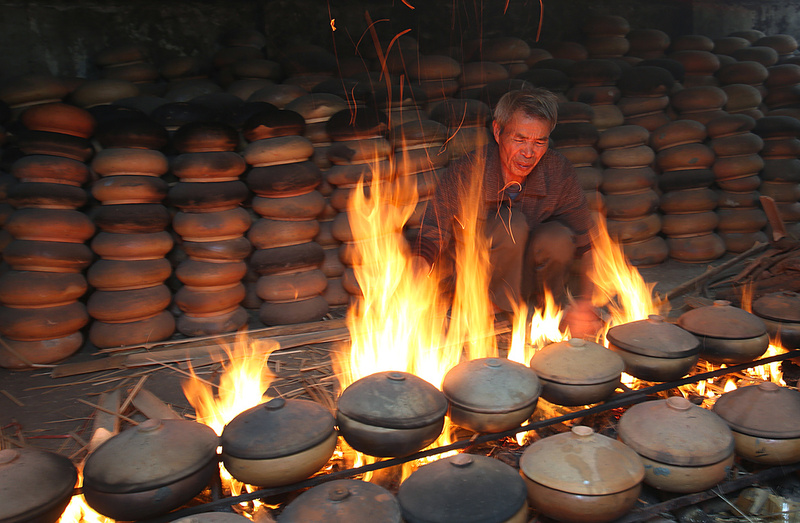 Each pot is cooked for 14 hours straight. 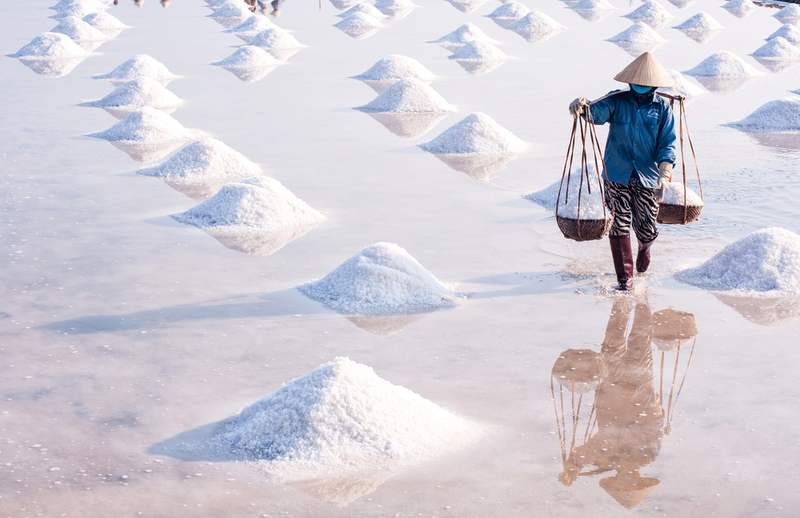 The Hon Khoi Salt Field, an hour’s drive to the north of Nha Trang Town in central Vietnam, is among the largest salt fields in the region. 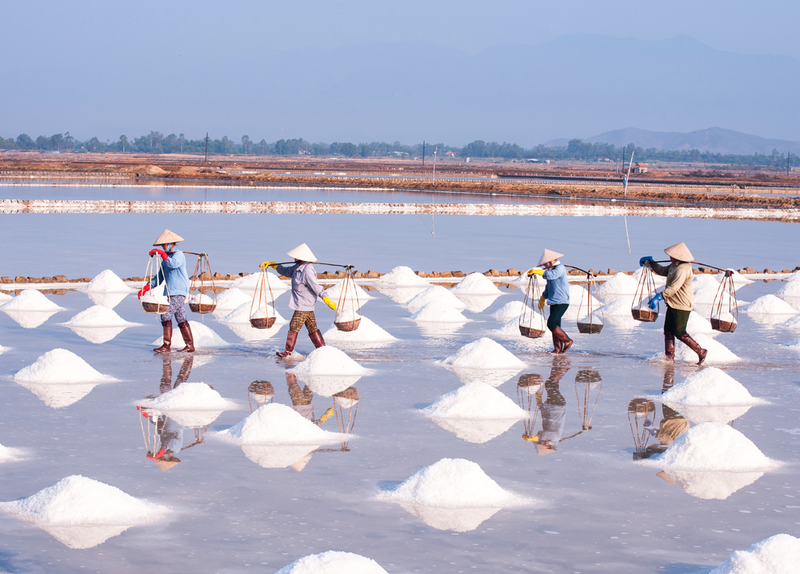 Spanning an area of 400 hectares (988 acres), Hon Khoi produces about 30,000 tons of salt a year, which is consumed nationwide and exported to Japan. Local farmers here have to get up before dawn to pour saltwater on the field and let it evaporate, and return in the afternoon to collect the crystals. A couple of layers of clothes and a conical hat are all the protection they have as they work under the burning sun for hours to eke out a living.